I was ready to head up into the mountains, but the coffee wasn’t quite ready, and I asked the other person waiting where he was heading. Burt, a truck driver, was a delight to speak with as he readily shared his life as a truck driver, describing many changes, in particular he felt the bonds between drivers and a code of ethics was not today what it used to be. I asked whether he had run into the storm the night before. I told him about the situation in which a torrential downpour was almost blinding, but I put the blinkers on and stayed over the white line at the side of the wall. Burt immediately corrected me on my error. We continued discussion drinking coffee. I much appreciated this man’s forthright description of work habits in today’s world. He was someone who put in long hours. After 30 years, he was still committed and felt passionately about being a truck driver. “Where did you park your truck?” I asked. We said goodbye with the ‘have a good day’ expressions, in which I felt genuine emotion. I checked the map for the exit to get off the highway to head West to The Rockies. When I started to drive away from the motel, there was Burt next to me in his truck. He appeared to be watching me drive away. I lowered the window and waved. Burt waived back. He was going back to his work place, ‘The Highway.’ ‘Olmsted’ was headed to Rocky Mountain National Park. Driving north and looking west, about 20 miles away, The Rockies appeared to rise up magically from the Plains in the early morning light. The mountains had glistening pockets in contrast to the rocky forms which so dramatically arose more about two miles above the mile high city of Denver and suburbs. After turning off the highway and heading directly toward the growing giants as I had imagined in my mind’s eye, a large lake appeared on the left side of the road. By instinct I pulled off, parked and spent a long time walking and standing quietly, transfixed into total awe. The lake was a mill pond, giant in size. The entire mountain range visible to the eye was reflected in a surreal purple on the water’s surface. The totality of the scene was so grasping. The day in The Rockies felt complete before it had hardly started. However, half an hour later, the road was winding up a steep grade. To the right, there was a deep gorge. After about 25 miles climbing up through an incredible gorge with rocks rising great heights on either side, where I was later told that Big Horned Sheep now are fairly common, I reached Estes Park. Clearly a highly commercialized area. However, this valley was surrounded by mountains, all rocky at the higher elevations. Even the lower areas, there were highly exposed rocks with trees somehow finding enough soil in which to grow. Blocking out the buildings and people, I imagined when people first hiked up to this magnificent landscape. In the Visitor Center, I met Paul, retired and, with his wife, volunteering. When I arrived, it was still early, and the center was not busy. Paul was very much aware of Olmsted’s work, and we talked for a long time. Very motivating to learn of his commitment, along with his wife, who joined in on our conversation. The Visitor Center was not a part of the National Park. Estes Park is a highly commercialized, powerful economic enterprise for the area, with people coming here from across America and around the world. Where will we be in future years? I gave Paul materials and had our pictures taken. I then met a group of about 12 students from a high school near Detroit, Michigan. We talked awhile, and we were going to have a picture taken, but one student was ill and began suffering great pain. It was recommended that the student be taken to hospital. No picture, but the descriptions of their three day camping out high in the mountains clearly demonstrated their love of Nature and commitment for Conservation. So many groups that I have met with have had terrific leaders and enthusiastic adolescents wanting to do something about sustaining the glories of Nature. Moving onto the groups of Rocky Mountain National Park, I visited two Visitor Centers, gaining understanding of the history of the mountains and multitudes of fascinating details about the Rocky Mountains. At the second visitor center, I met Rich, Ariel, and Karina. 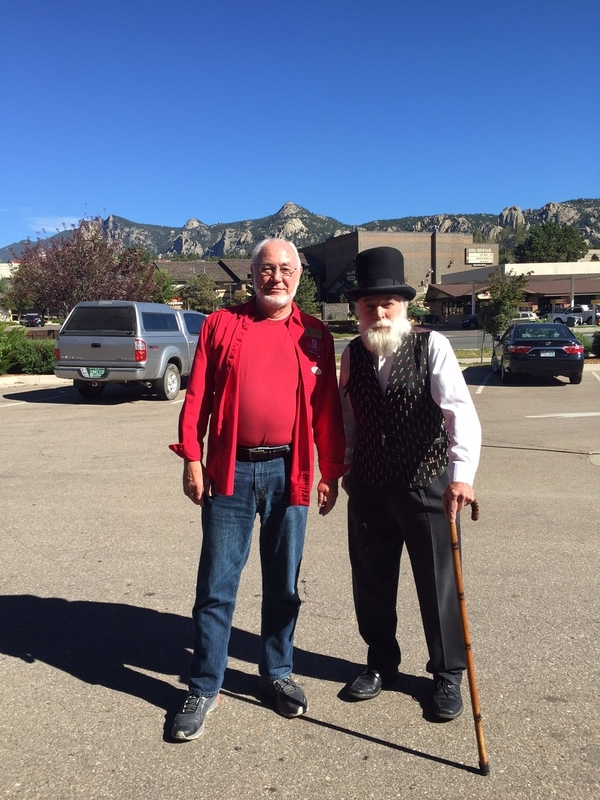 Again, I had long discussions on Olmsted and related issues with RMNP and our world today. Rich was a volunteer, “giving back to society.” Aeriel and Karina were Park Rangers. I then spent time along in the valley surrounded by mountains, notably, Long’s Peak at near 15,000 feet, in awe. Time had passed quickly. Parking lots were full. Over 5 million visitors during this 100th anniversary of Rocky Mountain National Park. No words will ever capture my spiritual journey with people and Nature.